We are proud to offer you not only a 3 year/ 36,000 mile warranty on all our rebuilds, but your warranty comes with a LIFETIME of free services as long as you own your vehicle. 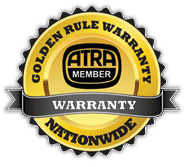 Our technicians are certified by ATRA (Automatic Transmission Rebuilders Association). What does this mean for you? The ATRA certification is more intense and extensive than other certifications, and brings a higher level of quality, confidence and knowledge to servicing your vehicle. Is your overdrive light stuck on or flashing? Is your transmission temperature light on or flashing? Is your transmission not shifting properly? Do you feel slips or erratic shifting? Do you feel harsh engagements when shifting from park into gear?